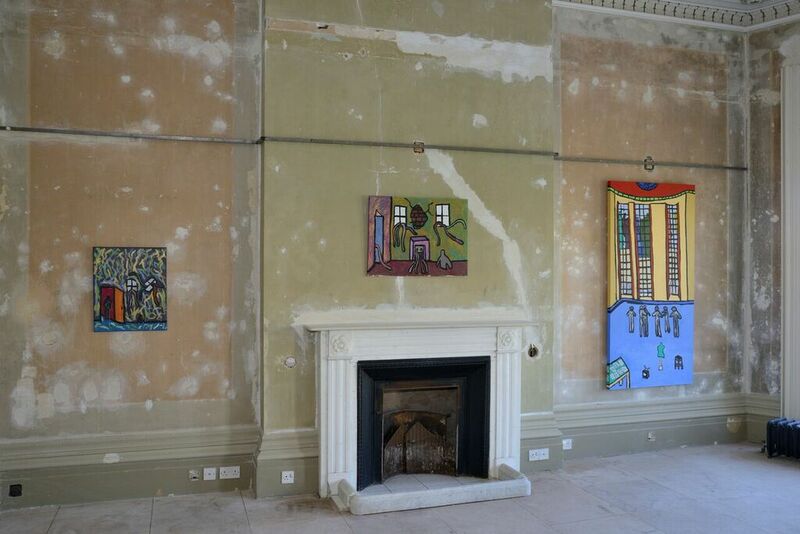 The HOUSE Festival Brighton 2016 Thompson Hall - Home Away From Home A HOUSE/Outside In co-commission at The Regency Town House 13 Brunswick Square, Hove 30 April - 29 May. The venue for this exhibition was a house with beautiful architecture and structure. It really worked well feeling like you are in a house and not museum. I like the boldness of the colours in Thompson’s paintings. Each piece of artwork he creates has different art techniques in the fine details. For instance, in one of his paintings he uses gold and silver paint to create a 3D effect on the railings giving them a shine when seen from a distance. There was a video in the first room I went into about how he makes his work and the techniques he uses. This helped to make sense of his work. I didn't know there were monsters in his paintings because it wasn't obvious until I heard him speak at the launch. After this it’s made complete sense when he told us that they were based on his intense anxiety. I can relate to how he feels because I have the same things with mine – it’s like dark bleak shadows creeping over me. Going to Thompson’s launch gave me courage to believe that anyone, disabled or not, can have an exhibition if they have the drive. Overall l really enjoyed this. A perfomance from the conference. 'Is that all there is?' 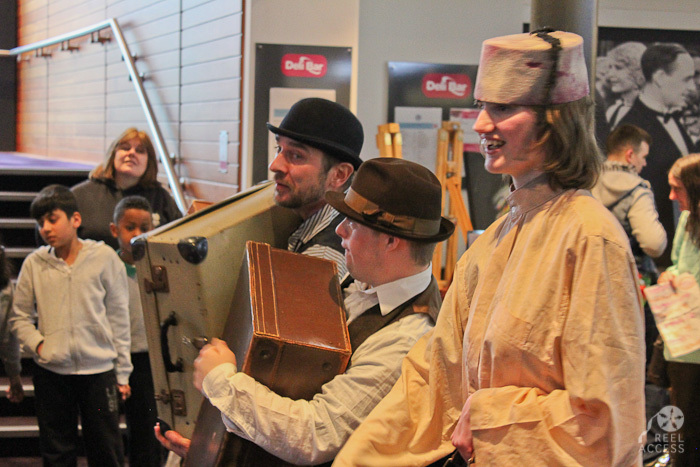 was a two-day conference organised by Open theatre Company designed to encourage fresh thinking about involving young learning-disabled people in the arts. It took place at Birmingham Hippodrome 9-10 March 2016. Well, the ‘Is That All There Is?’ conference is in the books, and will go down from my perspective as an event that saw the world of learning-disability arts take centre stage where it so richly deserves to be, and hopefully serves as the beginning of a change in the world of arts that is meaningful and positive. So basically, no pressure then! The two days of this conference saw delegates from the arts world coming to the Birmingham Hippodrome to engage in sessions, activates, and conversations with each other over what can be done to raise awareness of learning-disabled arts, how we can create a platform for artists with learning disabilities to be just as successful as non-disabled artists, and also in the process, maybe even make connections with each other and possibly work together in collaborative projects down the line. Sounds like a fool-proof plan, doesn’t it? Now of course, the only issue I can think of with the conference itself, and really it is the only one, is that we had more of the practical events (activates and other fun stuff) occur mostly on the first day, and then we had the more lecture-orientated and verbal events occur mostly on the second. This meant the first day was more fun, and the second day more wound down and less energetic, which, let’s face it, is something that we don’t want, right? So to avoid this in the future should the event be held again, Open Theatre Company needs to make sure that we have a roughly 50-50 blend of both of those elements so that everything over a two-day period is nicely balanced out. That sounds like a do-able plan, correct? CORRECT!!! Theatre needs to be accessible so learning disabled people don’t need a degree to get involved; show the skills you have, lead by example. This conference was a way for conceptual and thought-provoking work to be shared by young people and all of us delegates. 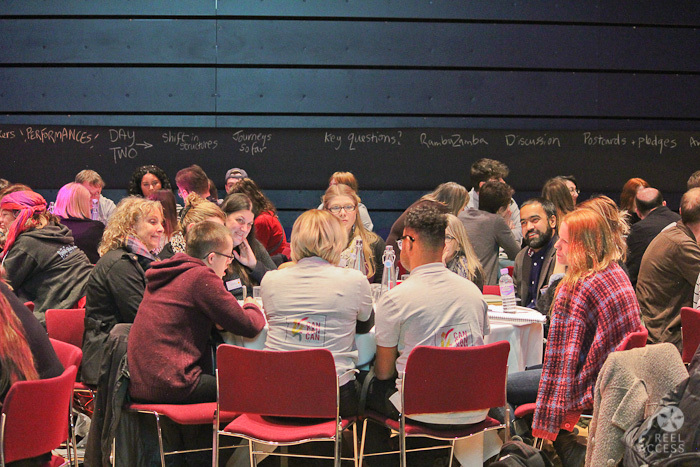 It was a way of networking and creating a change for the better in theatre and the arts sector. We were given tools to make a change by talking in groups, taking part in practical workshops and listening to talks by speakers. The best parts for me were when the groups happened and I could share my ideas freely with everyone and show my skills broadly to people. I have never seen so much creative work going on from such talented performers. They must have taken several weeks to perfect their routines. We all felt a sense of togetherness. People from arts organisations, young people, and teachers all came together in my spiritual habitation that I dearly adore so much. Accessibility had been thought about so we all felt included, whether they were disabled or not, everyone was catered for! I thought the things that were talked about were fantastic, everybody’s opinion was valued and shared, listened to and voiced in any way they could. I loved the table cloth idea of putting large sheets of paper to jot down notes, feelings and draw pictures. It inspired me to have a go and time flowed fast with everything going on. Contained 'True Stories from the Heart' took place at the New Wolsely Theatre, Ipswich on 9 March. Review by Sarah Watson. 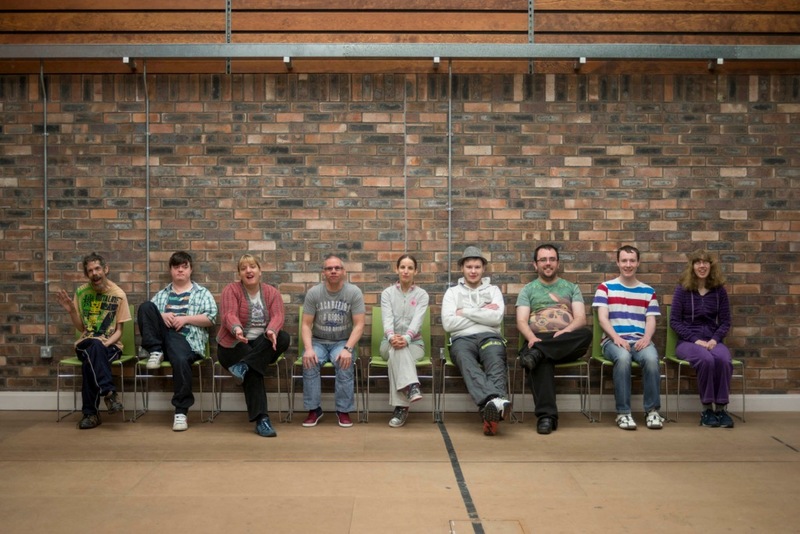 “CONTAINED is a vibrant, compelling and personal new show from England’s largest professional learning-disabled theatre company; nine interwoven stories about family and friendships, love and loss, the everyday and the extraordinary”. Mostly the show was really good and different from what I have seen before. It was nice to hear other views of the actors’ everyday lives including relationships, life skills, what they have seen in the arts and developed in music and the arts. I was a bit confused at one point where there were lots of different things happening on the stage and on several screens all at the same time. And I wasn’t keen on the live use of a green screen. The visual clips like spending an evening in the Louvre in Paris, France, which reminded me of when I was there. I want to go back now. A scene of company members playing musical instruments on a sunny day on green grass fields. The band was really good. It was really good for me to see so many other drummers. The acting and music was well suited to the themes of the show. I especially liked Jez Colborne’s singing. I went to see the new show by theatre company 1927. It’s called Golem. I saw it at the Old Market Theatre in Hove. It was heaving! The space was quite big, settling down into my seat, there were pictures projected onto the big screen on stage – I liked them, they were simple line drawings of people. At either side of the stage there was a drum set and a keyboard. At the start of the show we meet a band, all lit by red light. I liked how they had the piano and the drummer live on stage – they played a bit of punk music which was good! The red light in the punk scenes worked really well. The other unusual thing is the scenery, it looks like another stage, it was animated and changing a lot – that’s because it was all a projection. The projection was all drawings and cut-outs of newspapers. The colour scheme was browns, reds and yellows and the drawing style was simple. I liked it a lot – it stayed with me. 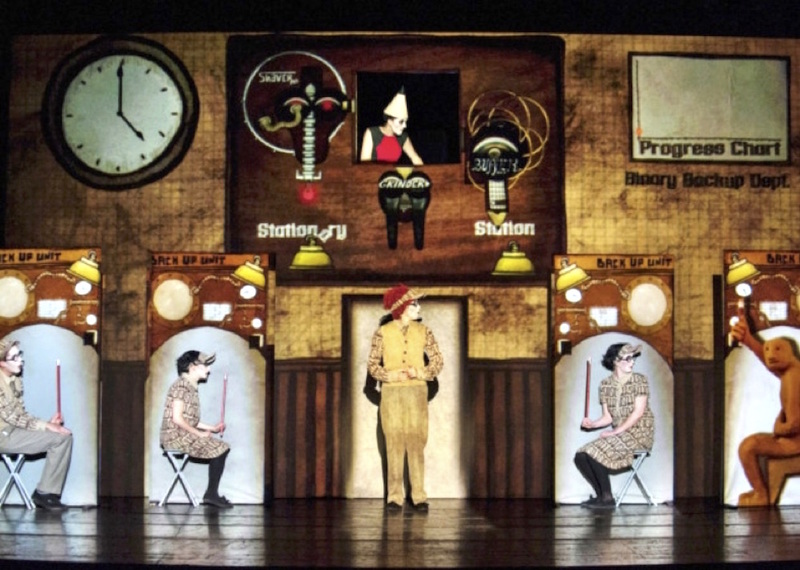 Everything was timed together, performers were moving and acting in time to the animations and the music – it was very clever. The show was trying to say how we are coming to a world where everything is the same, where we are told what to be, who to go with, what to wear and even what to think! It is about how technology gets inside your head – it was like brainwashing. After the show at the weekend I heard a voice in my head saying "change! Or you’ll miss out!". It made me think "are we becoming like this world?" The new phones and facebook and twitter – we’re all following the trends, following the latest technology and as a world we are becoming like that. Everyone becomes the same and stereotyped – even the punk band end up brainwashed. It reminded me of 1984. It was funny, I liked the humour, it made it more entertaining. It felt a little bit long without a break, I would have liked that. I would recommend it if you want to see something unusual, witty and thought provoking. Sarah Watson is a visual artist and photographer. She is Chair of Trustees for Carousel and a committee member for the Oska Bright International Film Festival. She was one of the founders of the Creative Minds movement.